You are here: Home / Online Jobs / Why Ad Reading Jobs is a Scam? 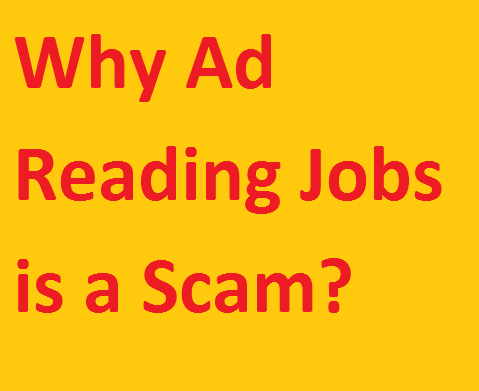 Why Ad Reading Jobs is a Scam? I always say and try to motivate my blog reader that always avoid such job that came without hard work. many people think to earn money online as they think that earning money here in online is so easy! But the reality is different . Here you have to spend all of your effort and skills in order to get paid. In days article we are going to review about ad reading jobs! And give you a solid explanation why should avoid ad reading jobs. Let’s be started. What actually the ad reading jobs? There is no specify demo on the internet to clarify how to do ad reading jobs and how to earn money with this jobs. Still, we guess it’s some type of program where you have to read ads and you will be get paid for that. Let’s explain this , Suppose you are an online marketer and you want to put your order by expecting some loyal customer into your products , now what would be full fellness if someone creates a platform called ad reading jobs and makes people register to read your ads and make payment for this. Sound bad right? The result will waste of money for the advertiser as people read your ads not because of your products interest but because of they wish to get paid for reading such ads. They don’t have any plan to buy something online at all. Is Clixsense Ad Reading Job is a scam? If you know Clixsense! They you might be wander is Clixsense ad reading job is alos a scam? Nope , Somehow Clixsense manage to pay for reading ads into Clixsense account and you can work here. Sounds interesting right? Let’s read here how I earn $50+ from Clixsense by doing simple 5-10 minutes work daily. Next to Read: Clixsense.com Review – How I Earn my First $25 from India?